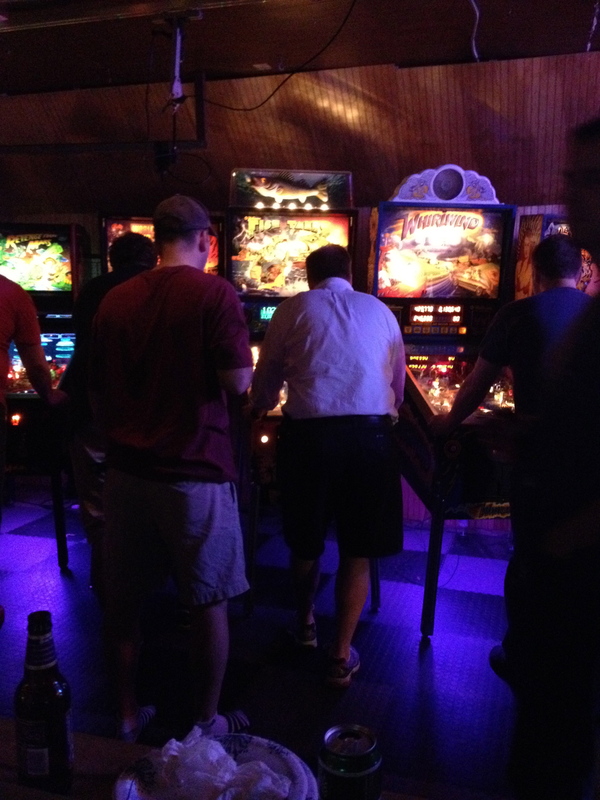 Second round of Season 2 took place at the Boocade with 17 players making the trip. 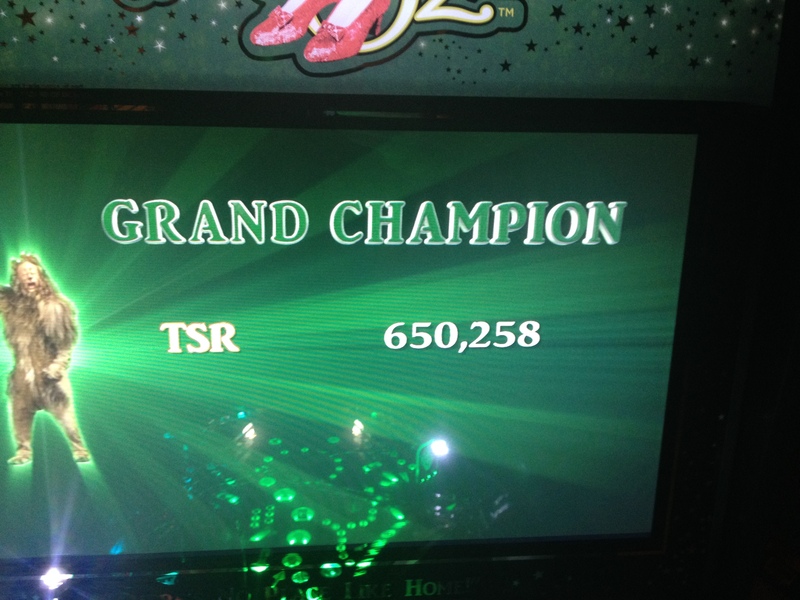 Great competitive pinball and some not so great pinball took place. Personally I rode both ends of the equation with a couple high scores on WCS and WW but played so horribly on RFM that it put me in a pinch to save the round. Bayless put up some very consistent scores to gain the most points on the night. Scott put up a monster score on RFM and in warmups dropped a score high enough to get on the board of WCS. Games for the night included RFM, WCS’94, FT, JL and WW. Iron Man was left out of the lineup for the night due to a random draw. The gasp that went through the room left me with goosebumps thinking that a Russian type takeover may be about to go down. Level headedness prevailed though and while it was missed it left a great game for people to grab games on once their groups finished up. 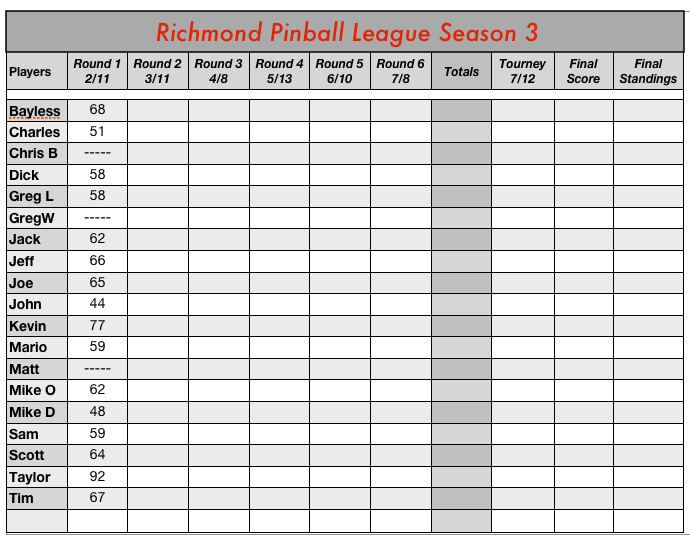 Here are the overall points after round 2. 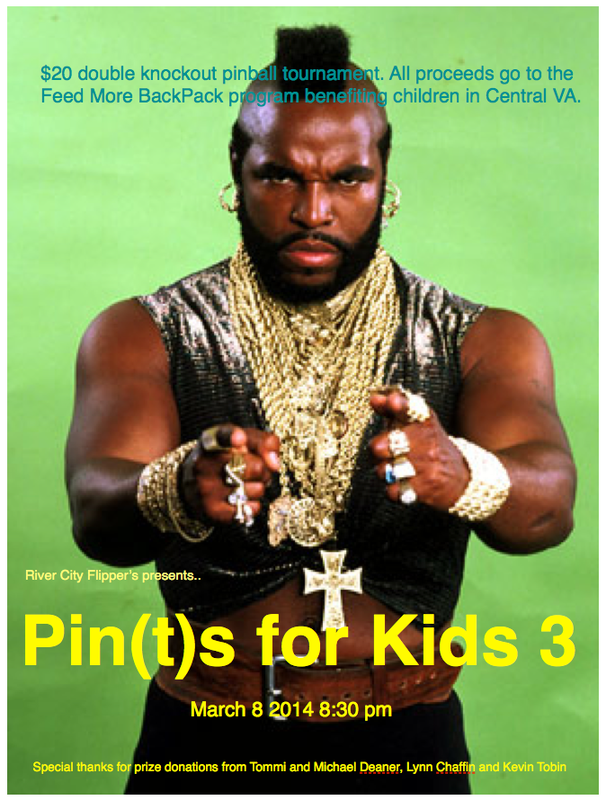 Well tonight I’m running my third Pin(t)s for Kids tournament. These were started about two years ago as a charity tournament to benefit the local food bank’s program for providing kids with meals. Since then we have raised around $2000. Sharing a hobby I love like this is the most rewarding things I have ever done. Not only do I get to use my games to help others, but I also get a chance to share my passion with non pinheads. More often than not a story creeps out how basically everyone played pinball at some point in their lives and how great it is to be getting a chance to play again. 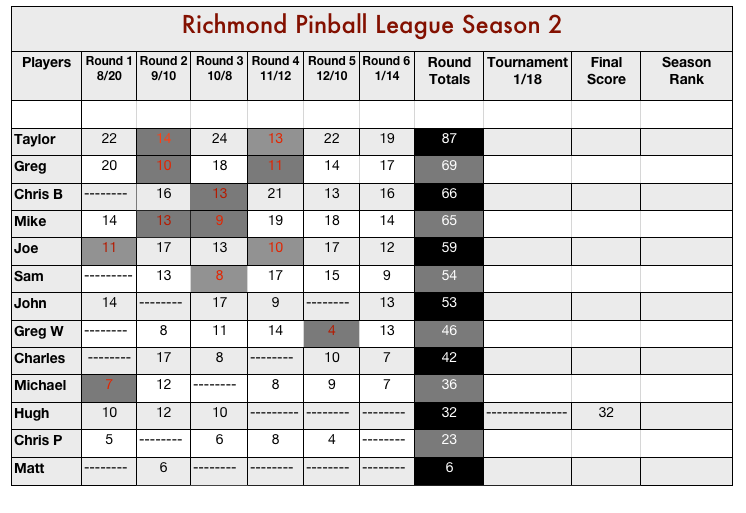 Several of our league members were sucked in by these tournaments. I’ll post more after the tournament but it has been a while since posting and this certainly seemed like a good thing to share. Had a great turnout for the 1st round of season 3 with a total of 16 players in attendance. A couple of the the veterans unfortunately missed due to prior commitments but that just means they’ll bring the heat next round. We had several new players make a showing with some strong play. Looks like season 3 is going to be a competitive one. Can’t wait!!! With a possible 19 points on the line in this weekend’s tournament the race for second and third place is very tight. First place for the overall season is locked up as long as I can roll out of bed. The tournament consist of 2 qualifying tournaments. Both are 2 out 3 double elimination tournaments at two locations. Top spot at each location is awarded 8 points, 2nd with 7 and so on. Any place below 8th also receives one point. The top player at each location will play in a best 2/3 to determine overall winner. Players coming in 2nd at each location will play for 3rd and fourth place overall. Today may have seen the biggest sign that pinball is back. In under 2 hours 400 people from across the globe signed up for the largest pinball tournament in the world. What took weeks to fill in 2013 filled faster than anyone could imagine. Registration began promptly at 12 noon today and I sat at my keyboard constantly refreshing hoping to land an early spot for nothing more than bragging rights. Glad I signed up when I did, with a server delay that seemed to take forever I was the 135th person signed up. Phew. 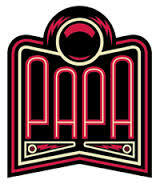 Chris and I are both planning our first pilgrimage to the hallowed halls of PAPA this spring. 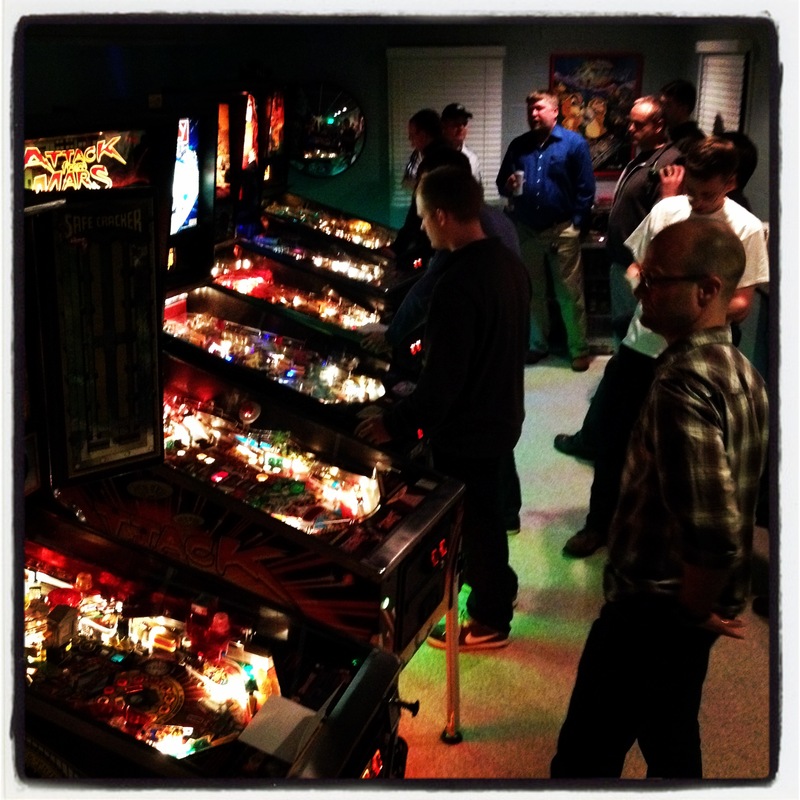 There is certainly no other place in pinball that I want to visit and I think that Chris feels the same way. I’ve been in the hobby about 9 years and this is really the first time that I have felt like I had to get to PAPA. I don’t what it is, could be the history of it rising from the soggy grave from the flood 2004 or getting a chance to see some of the greats donkey kick their way to greatness. There is an allure to PAPA that has a hold of me and this is my year… and I can’t wait. 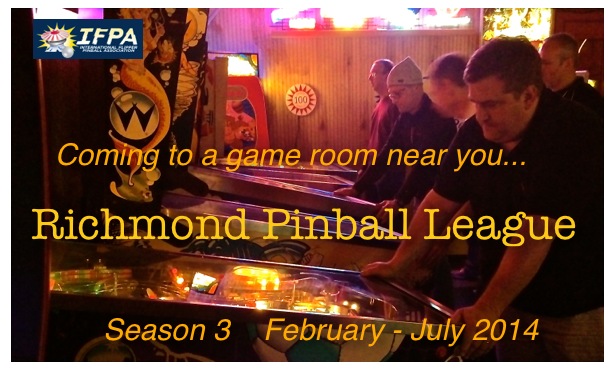 So here is the deal with Pinburgh, you get to play a LOT of pinball. 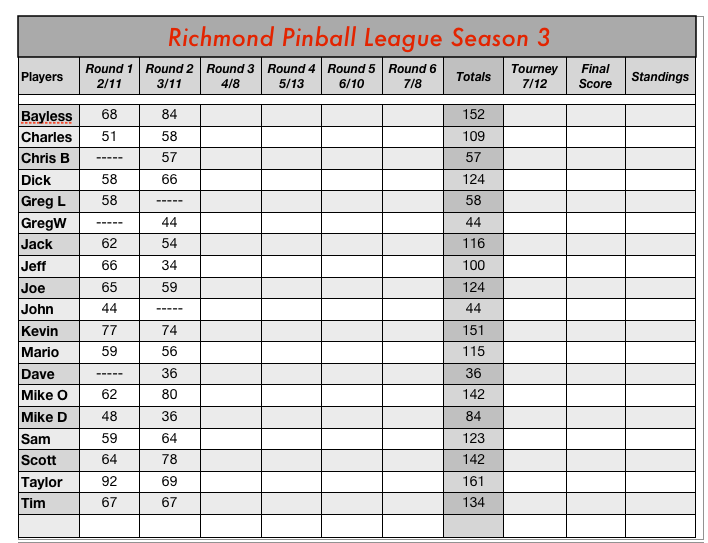 I don’t exactly know how it works and I am pretty lazy to reading in depth rules but one thing I know is that I am going to get to play a LOT of pinball and possibly some pinball with some of the top players in the world. What I do know is that Pinburgh is set up as a match play tournament. 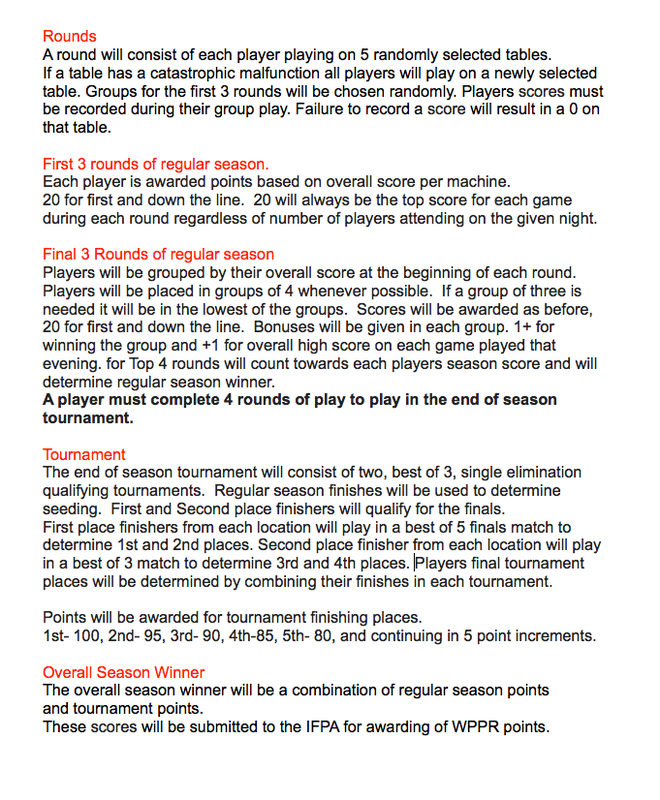 You are placed in either 3 or 4 player groups and you get points for how you finish on each table. You play for 2 days like this and that is used to determine what group you will be playing in and attempting to qualify for. So basically you’re guaranteed two days of competitive play against varying players, not too shabby. Finally knocked that JJP off of his throne!!!! Insane game.